Ann Arbor Downtown Development Authority board meeting (June 1, 2011): At its regular monthly meeting, the DDA board performed the annual exercise of revising its budget to match actual expenditures for the fiscal year, which ends June 30. It was the only item on the agenda requiring a vote, which was unanimous. The DDA’s FY 2011 budget showed $23,038,310 in expenses against $19,111,321 in total income. At Wednesday’s meeting, the board also recapped the previous night’s session of the Ann Arbor city council, which had been a continuation of the meeting that began on May 16. At that meeting, the council had finally ratified its side of a new contract under which the DDA would continue to manage the city’s public parking system. Key elements of that contract include a transfer to the city of Ann Arbor of 17% of annual gross parking revenues, reporting requirements by the city to the DDA about parking enforcement and street repair, and the ability of the DDA to set parking rates and hours without a city council veto. The DDA board will likely schedule an extended board meeting in September to prepare for a contractually-required joint working session with the city council, which will include a discussion of parking rates and hours of enforcement. Included in the usual range of the DDA’s reports from its committees was a review of a recent partnerships committee meeting, when DDA board members began to consider how they would handle the responsibility to plan future uses of city-owned surface parking lots downtown. The DDA was given that responsibility in a city council resolution passed at the council’s April 4, 2011 meeting. By way of introducing the resolution on the agenda to revise the budget, Roger Hewitt observed that the DDA passes a budget every year, but is required by state law to amend the budget to reflect actual income and expenses. That’s what the resolution was about, he said. Hewitt ticked through the line items that accounted for revisions in the TIF (tax increment finance) fund budget. One item was an added employee. Another line item requiring revision was for energy grants – it had been increased from $200,000 to $381,000 due to unspent money from previous years. The interest payment on the former YMCA lot was shifted out of TIF and into the parking fund. The payment to the city for the municipal center was reclassified as a grant instead of bond payment. There’s an added expense for the real estate consultant – The Roxbury Group – in connection with the Library Lot request for proposals (RFP). The Zingerman’s Deli brownfield program is a $207,000 item, and the return of excess TIF capture to taxing units in the DDA’s district amounted to $473,000. Some items that are under budget include lower expenses on the Fifth and Division streetscape improvement project. For the Fifth Avenue underground parking structure, the entire bond payment will be made out of TIF fund for the first five years – after that, the parking fund will take over, said Hewitt. For the bottom line, the TIF fund expenses are $850,000 lower than originally budgeted. In the parking fund, the budget revision reflects about $800,000 less revenue – due to a delay in new rates going into effect. The rate increases had been delayed from July 1 to Sept. 1 due to concerns about the negative impact on summer business. Legal fees had increased due to work on the new parking contract. About $200,000 had been saved by having Republic Parking staff do information technology work instead of contracting it out to a different entity. Overall expenses for Republic Parking were down this year. Bond payments for the underground parking garage are reduced, because the TIF fund will pick up that cost for the first five years. Hewitt touched briefly on the other two funds in the DDA’s budget – the parking maintenance fund and the housing fund. The parking maintenance fund didn’t get its usual $2 million transfer this year. Actual parking maintenance expenses had been reduced from $1 million to $600,000. Maintenance costs had been deferred, but over the 10 years in the DDA’s 10-year plan, Hewitt said, the maintenance fund would remain whole. The deferred schedule was based on recommendations from the DDA’s engineering consultant. The DDA had elected not to go ahead with installation of additional e-park stations, saving $1.3 million in the short term. Russ Collins confirmed with Hewitt that the $2 million reduction in parking fund expenses had been achieved primarily by deferring maintenace. 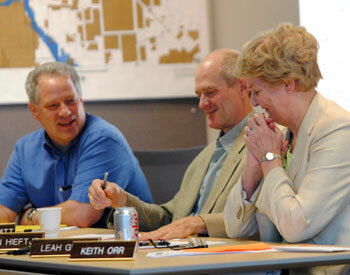 Outcome: The DDA board voted unanimously to approve the changes to its FY 2011 budget. Board chair Joan Lowenstein invited Roger Hewitt to make the report out from the DDA’s “mutually beneficial” committee by saying that she hoped this is the last time the board ever has to ask for such a report. Hewitt reviewed recent events, including the special meeting the board had convened on May 27 to ratify the final version of the new parking contract under which the DDA would continue to manage the city’s public parking system. Hewitt reported how the previous evening, the contract had been considered by the Ann Arbor city council, and had provoked a two-hour debate – an hour and a half of which he’d spent answering questions from councilmembers. Some of the questions Hewitt described as “relevant,” and some had not been so relevant. Hewitt reported that an amendment on restoring a council veto to the contract was defeated 9-2, and the vote on the contract was approved 11-0. So now there’s a new parking contract, Hewitt said. It begins July 1, 2011 and lasts for 11 years – there’s an option for both sides to renew it. The contract will allow the DDA some flexibility for parking demand management. For their work on the contract Hewitt thanked the DDA staff – Susan Pollay and Joe Morehouse. Pollay had been invaluable in making sure the contract gives the DDA the tools it needs, he said. The contract language is much more clear, so there will be no misunderstanding about what it means. He said that Morehouse had repeatedly been given a new set of numbers to run – he’d cranked out an enormous amount of data to help come up with an agreement the DDA can live with. Lowenstein said a big advantage of the contract is greater stability. She said the DDA didn’t want to give up as much money as the contract calls for, but that the DDA will move on and will be better for it. She thanked Hewitt for his work and mayor John Hieftje for “steering the discussion” at the city council meeting. Russ Collins described the contract negotiations as a long process. But he said that “we need to ask ourselves: Did we do right by the voters, taxpayers, citizens?” Collins said he appreciated some of the dialogue about the parking contract generated by city council. He may not have appreciated it immediately when he heard it, but he did appreciate it, he said. He also added that he hoped the city council appreciated the DDA’s dialogue. Sometimes people get whipped up in the controversy without stepping back and understanding what the accomplishment is, Collins said: The parking system is excellent. Parking, he continued, is an emotional issue that transcends logic. Miraculously, Collins said, both the DDA board and the city council had unanimously approved the parking contract – they can’t lose that point. That makes all the “Sturm and Drang” worth it, he said. Collins thanked Lowenstein and Hieftje. Hieftje noted that the council had also passed another resolution recognizing the issue of excess TIF capture, and councilmembers had agreed to waive the $712,000 in excess taxes that had been captured from the city of Ann Arbor since 2004. Later, during the discussion on budget revisions, Gary Boren asked how final the excesss TIF capture issue was. Had the other taxing units accepted the calculations as correct? Hewitt told Boren the numbers are based on the opinion of Jerry Lax, the DDA’s legal council. Another taxing authority could challenge the DDA’s calculations, he said. The city of Ann Arbor’s share, in any case, is roughly 60% of the total. Lowenstein confirmed that the return of the excess TIF to other taxing authorities would be made by the end of this month. Hewitt noted that during the council’s May 31 session, an issue had been raised [by councilmember Stephen Kunselman (Ward 3)] about a possible non-payment of $1 million owed to the city by the DDA, which is related to parking revenues (not excess TIF capture). The issue concerned the payment of the second part of $2 million that the DDA had awarded the city of Ann Arbor last year, which had not been required under the parking contract then in place. Russ Collins reported that Cresson Slotten, the city of Ann Arbor unit manager in the systems planning division, had given a presentation to the partnerships committee on the city’s water and sewer system. Collins said citizens should know that most of it was installed about 100 years ago – things have changed over the last 100 years. They want to develop a shorter term 5-year vision as well as a 25-year vision, Smith said. She noted that local developer Peter Allen has also made some efforts in this direction, too, already talking to individual business owners in the area of the Library Lot, where the DDA is building an underground parking structure. Allen is doing this on his own, Smith noted. She said the committee had asked Kelbaugh and McCullough to come up with a specific proposal, and they’ll present that at the next meeting of the DDA partnerships committee. The DDA can then decide if it wants to hire them. The next meeting of the partnerships committee is June 8, 2011 at 9 a.m. at 150 S. Fifth Avenue. Local developer Peter Allen appealed to the map on the wall for his brief remarks made during public commentary at the DDA board’s June 1 meeting. Peter Allen was also present at the June 1 meeting. He took the opportunity –provided at the end of all DDA board meetings for public commentary – to briefly sketch some preliminary feedback he’d heard from those people with whom he’d spoken so far. He described the need to connect “four corners,” which are: the Allen Creek greenway; the riverfront of the Huron River; the Fuller Road Station (a proposed parking garage, bus depot and possible train station); and the University of Michigan campus. 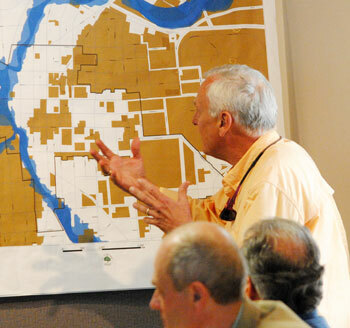 Ray Detter’s report from the downtown citizens advisory council (CAC) also focused on future planning of downtown. Detter explained that he had not attended the previous month’s DDA board meeting, because he’d been helping with tours given to 400 high school students to introduce them to the city’s history. He also plugged his annual party, which takes place on June 9. Detter told the board that the CAC’s meeting the previous evening had included a recommitment to support transportation area planning and the Fuller Road Station – they hoped for an improved design as a result of recently acquired federal funding. The CAC continues to support the downtown planning of the Library Lot, he said. The CAC had unanimously agreed that the Library Lot should be more than a park – it should be a mixed-use development that includes an as-green-as-possible plaza. That new plaza should be connected to Library Lane – a small east-west road, just north of the downtown library building, that will connect Division and Fifth. Whatever is approved for the Library Lot should add to the city’s tax base, Detter continued. That all sounds like “standard stuff,” allowed Detter. He told the board: “That’s our position and we’ll be sticking to it!” As for the suggestion that the city needs to go back to community for further consultation, Detter said the CAC thinks the last six years that began with the Calthorpe process has already done that. Out of that process had come a community vision and revised downtown plan and downtown parking study. Everybody had their say, Detter contended – city officials, planning staff, and the community. The A2D2 rezoning process reinforces “our faith in planning,” Detter said. A2D2 replaces a hodgepodge of zoning districts with just two: D1 and D2. Finishing the design guidelines took an additional year, Detter said. Detter mentioned that coming up very soon, on the site of the Prescription Shop on Washington Street, another student-housing type development was being planned – the CAC hopes to be able to support that project, Detter said. Roger Hewitt characterized the parking report for April 2011 as containing nothing dramatic. The 5.5% increase in revenue compared to last year reflects a parking rate increase in the 6-7% range. So overall, Hewitt said, there’s slightly less usage, but it’s essentially pretty flat. The number of hourly patrons is up slightly. Hewitt also pointed out that the parking system has about 200 fewer parking spaces than it had a year ago – due to the loss of parking spaces because of construction. Hewitt concluded by reiterating there is nothing particularly dramatic – it’s not growing, but it’s not clearly shrinking, either. Hewitt said there are two private developments underway [601 S. Forest and Zaragon West – previously known as Zaragon II]. So there’ll be some additional demand when they’re completed, he said. Construction on the new underground garage at Fifth Avenue will be completed by that time, Hewitt said, so the parking system will have some flexibility. Roger Hewitt also reported on the results of a regular survey of parking system customers: 147 responses had been received in April – a 10% response rate. Of those, 41% had rated the system as excellent and 33% had rated it very good. Considering how many people normally react to surveys, Hewitt said, that’s a high percentage. He noted that typically everyone wants plenty of parking and they want it to be free. Sandi Smith then followed up on a brief discussion of parking customer payments made by credit card, which took place during the budget adjustment deliberations. Those deliberations had drawn out the fact that increased use of credit cards by parking customers had resulted in additional fees of $7,000. Hewitt said it reflected the fact that payment by credit card at the new on-street kiosks is being embraced by the parking public – 58% pay with credit card. Deputy DDA director Joe Morehouse said that the credit charge processing fee is 5.5%. Based on his experience operating a restaurant, Hewitt said, the smaller the charge is, the higher the percentage. Joan Lowenstein said there might be some federal legislation passed soon that could reduce that percentage. What Smith wanted to know is if zip code data could be obtained from credit card companies, or if that information could be required at the point of payment. Morehouse indicated that he would look into that. Smith also suggested that the board schedule an extended meeting at the end of the summer to look at the impact of the newly ratified parking contract on the DDA’s 10-year plan. Hewitt noted that the revised budget would be plugged into the 10-year plan. He also noted that under the new contract, the DDA board would need to hold a joint working sessin with the city council in October. Based on that, Smith suggested that the extended board meeting could take place on an afternoon in September. Reporting out from the DDA’s economic development committee, Joan Lowenstein said the committee was in a listening-and-learning mode. At the last meeting, the committee had representatives from different downtown area associations and the Main Street business improvement zone (BIZ). Generally, business is up, but not where it was before 2008, they’d reported. They’re grateful to the DDA for help in navigating various city of Ann Arbor logistical hurdles. They’d like to see additional involvement in retail recruitment. From Maura Thomson, executive director of the Main Street Area Association, they’d heard that business is trending up, but retail businesss have to change their approach – they can’t be just bricks and mortar. Maggie Ladd, of the South University Area Association, had reported excitement about 601 S. Forest, a residential complex that’s under construction and will offer retail floor space. It’s hoped that an anchor store can be attracted, and maybe the DDA can help with that kind of recruitment. Lowenstein said the South University area is also considering formation of a business improvement zone. Karen Farmer had attended for Kerrytown Market & Shops, Lowenstein reported, and while there was no official representative of the State Street Area Association, committee member John Splitt [who owns Gold Bond cleaners on Maynard Street] was there. Zaragon II – an apartment building going up at William and Thompson, and now known as Zaragon West – is anticipating more retail space. They’re looking for a resurgence of retail as more people live downtown. Ellie Serras talked about the success of the Main Street BIZ with sidewalk snow removal. The next main project of the committee – production of a DDA annual report – will be undertaken by DDA research and planning assistant Amber Miller. It will be a glossy annual report that can be used as an informational document and as a selling point. It will describe DDA projects and their impact on the downtown, as well as giving a picture of the current state of the downtown. The report should be finished by the end of the summer or even by the end of the month, Lowenstein said. In response to Kunselman’s complaint, at the council’s May 31 session, DDA board chair Lowenstein had documented an order placed with AnnArbor.com earlier this year to publish the information required under the statute. John Mouat reported that the DDA’s transportation committee had discussed two topics related to pedestrian safety. They’d received a presentation from Erica Briggs, who works with the Washtenaw Bicycling and Walking Coalition (WBWC). Briggs is working on a project with a DDA matching grant to educate the public about crosswalk laws. The first step is getting a baseline, using a survey and observation. The other issue the committee addressed was how to use limited funds in targeted areas. Mouat noted that the railroad crossing at William is in poor shape – the DDA could contribute a small number of dollars to get a federal match. On Huron Street, under the railroad tracks, there’s also an area that could be targeted. In connection to the Huron Street location, Mouat alluded to public commentary made by Bill Gross, property manager for 416 W. Huron, at the board’s February 2011 meeting. The committee had also worked on identifying trip hazards downtown, and had looked at crosswalk improvements at State and Liberty, and at Fifth and Huron. Vegetable-shaped bicycle hoops will appear at the farmers market later in summer, Mouat said. The next meeting of the transportation committee will focus on the getDowntown program. Invited to the podium, Nancy Shore, getDowntown’s executive director, told the board she would be presenting the transportation committee a report on the go!pass bus pass program. It’s had tremendous success, she said – the program has broken ridership records. Now that the go!passes can be swiped at the farebox for AATA buses, the program has more data about how the cards are being used. The annual commuter challenge in the month of May has also just wrapped up, Shore said. The getDowntown program is also looking at the question of where the organization will be housed, with one possibility being at the DDA offices. It’s an issue that will need discussion by the getDowntown board, she said. Shore noted that the DDA contributes a tremendous amount to the getDowntown program, which she said has a huge impact on downtown employees. Sandi Smith reported that Dave Konkle had briefed the partnerships committee on the DDA’s energy grant program. The question before the committee is essentially whether to make grant awards on a first-come-first-serve basis or to make it a value-based program. Also, should the DDA try to make many smaller or fewer bigger grants? Those issues will be the focus of the June committee meeting, Smith said. John Splitt reported that the only work being done in connection with the Fifth and Division streetscape project is on Division north of Huron: curbs are being re-aligned. On Fifth between Washington and Liberty streets, a 12-inch water main is currently being installed. Joan Lowenstein clarified that the city of Ann Arbor is doing the water main work. Splitt went on to explain that the DDA’s project would follow on that work, so that the street would not have to be repaved, torn-up, then repaved again. Splitt reviewed how the underground parking project is divided into three phases: (1) the east leg – walls are complete or close to being completed; (2) the middle – slabs are still being poured; and (3) the western edge – the foundation will soon be poured, then the structure will be built up from there. Splitt described the work as “progressing nicely.” Repairs and additional reinforcement to the earth retention system will all be complete by the end of this week, he concluded. Joan Lowenstein led off the meeting by welcoming back Susan Pollay, the DDA’s executive director who’s been out on medical leave for a few weeks. 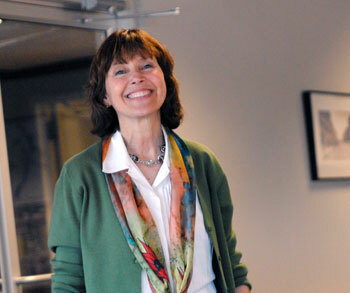 Susan Pollay, executive director of the DDA, has returned to action. Lowenstein said the board also felt great seeing Joe Morehouse, deputy director of the DDA who’s filled in for Pollay in her absence. But she ventured that no one is happier than Morehouse to have Pollay back. Purely a plug: The Chronicle relies in part on regular voluntary subscriptions to support our coverage of publicly-funded organizations like the Ann Arbor Downtown Development Authority. Click this link for details: Subscribe to The Chronicle. And if you’re already supporting us, please encourage your friends, neighbors and colleagues to help support The Chronicle, too! There’s a reason California made the collection of zip code data with credit card payments illegal. If the DDA wants my data, it’s welcome to pay me for it. I couldn’t be more disappointed in my friend Ray Detter’s assertion that no public consultation is required in terms of planning for the disposition of the City-owned parcels downtown. All the A2D2 efforts Ray mentions have been solely directed at the development of an updated master plan and zoning for downtown. This is routine City business and is actually required by State law to occur on a regular basis. Now that this comprehensive, downtown urban planning effort is nearly complete (the design guidelines process remains to be implemented), it is time to drill down and focus on the properties that we, the people, collective own; not as planners, but as owners. What is the best use of our property, as viewed through the prism of our new master plan and zoning? How can we get the most bang for our equity in these properties? Should they simply be sold at market rate? Should they be held for a public purpose? Should we try to play developer again? What do other studies and plan say? From a slightly broader perspective, how do these City-owned parcels relate to their immediate surroundings and what can we do in terms of cooperating with other public entities such as the Library, AATA, the Federal government, and the County to ensure that they are not working at cross-purposes? Because the City and other public entities own such a large amount of key downtown property, and most of them are exempt from local planning and zoning laws, how those properties are developed (or not developed) is just as important, if not more important than the new ordinances that only affect private developments. On a side note, now that the conference center idea has been thoroughly vetted and dismissed, I would hope that the Planning Commission and City Council would move to immediately strike this oddly specific (and contradictory) language from the Downtown Plan. I’m equally disappointed at Ray’s endorsement of the Fuller Road Parking Structure. This facility, despite the DDA wayfinding sign at Fuller and Maiden Lane that declares the area to be “downtown,” is in fact, not downtown, and therefore has nothing to do with the DDA or its CAC. Why would this even be on their agenda? Am I correct in understanding that annarbor.com does not accept “orders” for the publication of legal notices and other required public information such as DDA reports? I believe that is why the actual publication has been [still?] in the Washtenaw Legal News. City Council also tried to change ordinance to allow the City itself to meet legal notice requirements by [paraphrased here] any reasonable means, such as the City website. These measures seem to be inadequate, even if deemed reasonable, and maybe do not meet state legal requirements of timeliness. @Whitaker, I agree. A community-based vision has not yet been achieved. An opportunity to create such a vision for the very core of downtown is rapidly approaching. The DDA will lead some kind of public dialogue regarding four blocks bounded by Main, Liberty, William and Division. [Downtown belongs to all of Ann Arbor.] While I yearn for a more comprehensive community-based vision and plan, this could be a good start. Time to inform ourselves and fully engage in a productive process.